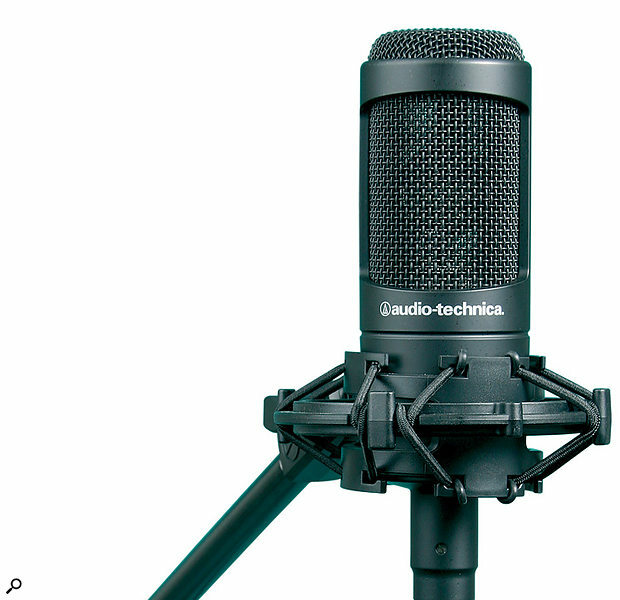 Industry stalwarts Audio-Technica introduce two new microphones that offer a similar character to their popular AT2020, but with better performance and additional features. 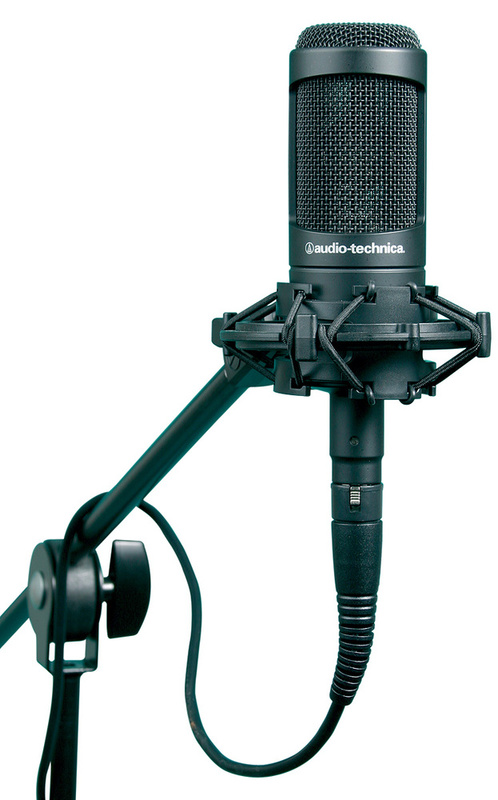 Audio-Technica have established themselves as one of the most respected manufacturers of budget and mid-priced microphones. Indeed, their AT2020 has proved itself to be one of the best value studio mics around. They recently launched two new models, the AT2035 and AT2050, both of which are an evolution of the original 2020 design. Like the 2020, the AT2035 has a fixed cardioid pattern. A back‑electret model, in the usual side‑address format, it is designed to accommodate high SPLs with low background noise, and has a capsule diameter of approximately 0.8 inches. This mic comes complete with a custom shockmount, made of high-strength plastic, and an elastic suspension (the mic is gripped by simple friction), and it features a switchable 80Hz high‑pass filter and a 10dB pad switch, something the 2020 lacked. It can operate on phantom power from 11-52V and has the usual low-impedance balanced output on a standard XLR connector. The frequency range is simply quoted as 20Hz to 20kHz, with sensitivity of –33dB (22.4mV) ref 1V at 1Pa. There's a small presence peak around 12kHz, but otherwise the frequency response is pretty flat, so the designers seem to be aiming for a neutral sound rather than an obvious tonal character. Without the pad, the AT2035 can tolerate sound levels up to 148dB SPL (1kHz), which in itself is impressively high — but switching in the pad gives you another 10dB. Self-noise is a respectably low 12dB EIN, equating to a signal‑to‑noise ratio of 82dB at 1kHz at 1Pa — some 8dB lower than that of the AT2020. Structurally and cosmetically, the AT2035 is very similar to the 2020, weighing 403g and measuring 170mm long, with the widest point of the body being 52mm in diameter. Its all‑metal casework is finished in a satin black with silver legend, and the two slide‑switches for the pad and low‑cut filter are recessed at the base of the body. There's no fancy flightcase (saving on both cost and storage space! ); the mic comes in a cardboard box with the shockmount, a vinyl storage pouch and a mic-stand thread adaptor. Unlike the other two mics in this range, the AT2050 has switchable polar patterns: omni, cardioid and figure‑of‑eight, using the expected back‑to‑back capsule arrangement. Like the 2035, it has a switchable 80Hz high‑pass filter and a 10dB pad, and the internal circuitry makes extensive use of surface‑mount components to conserve space. The two capsule diaphragms are gold‑sputtered and subjected to an ageing process designed to promote long-term stability of performance. The 2050 runs on phantom power, in the same 11-52V range as the 2035. This mic also comes with an identical vinyl pouch, a shockmount and a thread adaptor. The frequency response is, again, simply quoted as 20Hz to 20kHz, and the open circuit sensitivity is rated as –42dB (7.9 mV) ref 1V at 1 Pa — which is a little lower than for the AT2035 or the AT2020. SPL handling is pretty much the same as for the AT2035 (149dB SPL, or 159dB SPL with the pad switched in), but the equivalent input noise is a little higher, at a still respectable +17dB SPL, which is still some 3dB lower than for the original AT2020. Outwardly, the mic is identical to the AT2035, except for the addition of a pattern switch, and the similarity in specifications suggests that variations on the same capsules may be used, although the response plot shows a slightly more obvious presence hump over the 4-12kHz region, and a slight LF droop in the figure‑of‑eight mode, starting at around 500Hz and dropping around 3dB by 20kHz. The shape and extent of the presence peak differs between the different polar patterns, with the flattest response obtained in cardioid mode, where the main presence peak — which is about 4dB in amplitude — occurs at around 10kHz. The AT2035 and 2050 are almost identical, with the only obvious external distinction (other than the model number on the rear) being the inclusion of a polar‑pattern selector switch on the front of the AT2050 (left). Conducting subjective tests alongside my own AT2020 confirmed that, with the pad and low‑cut filter switched out, the AT2035 sounded subjectively very similar to it on vocals, but it was more sensitive than the AT2020 and also produced less background noise. Switching in the low‑cut filter robbed the low end of the vocal range of a little of its warmth, but in situations where the pad was needed it proved to be very effective in reducing low‑frequency spill and plosive popping. The general character of both the 2020 and 2035 was what I'd describe as 'hinting at the vintage', with a warm and slightly compressed sounding mid‑range and a very smooth high‑end. The 2035 produced a slightly flattering result that I found easy to listen to, but didn't go so far as to make the sound obviously coloured when used on vocals. I also had success using both the 2035 and the 2050 on acoustic guitar and electric guitar amplifiers, so in the context of the home studio they should be good all‑rounders. In accordance with the published specifications, the 2050 was noticeably less sensitive than the 2020 and 2035 — presumably due to the need to leave extra headroom when summing the outputs from the two capsules. In cardioid mode it comes very close to the sound of the two dedicated cardioid models (once the levels have been matched). This isn't surprising, when you consider that in this mode one of the two cardioid capsules is active and the other switched off. What did surprise me was how consistent the sound remained when switching patterns, even though the frequency plots show presence‑peak characteristics that vary slightly in the different modes. There were no nasty shocks when I decided to try a different pattern setting (but it's as well to turn the monitors down when you do this, because you get the inevitable pops and bangs when switching over). The front and back of the 2050 in figure‑of‑eight mode sounded subjectively identical, as they should do if the capsules are well matched, and side‑cancellation was nearly perfect. I've never yet tried a dual‑diaphragm microphone whose omni mode works as well as a dedicated single‑capsule omni microphone: the latter always seems to produce a more natural sound, with a more evident sense of space around it. The AT2050 is no exception to this rule, but it's fair to say that in most instances it will get the job done perfectly well, and it certainly managed to sound more open and airy than it did in cardioid mode when used further from the source. The omni mode exhibited no evident low‑frequency boost (proximity effect) when used close up, as is experienced in the cardioid and figure‑of‑eight modes. This, again, is exactly as it should be. I have to admit to having a fondness for the general sound of the AT2020, which is all the more impressive in light of its low cost. The AT2035 retains the same tonal characteristics while improving on its technical performance by offering a flatter low‑end response and significantly lower noise. The addition of pad and low‑cut switches, and the very practical shockmount, are welcome. It does cost a little more, but the price differential is probably no more than you'd pay for the shockmount on its own. Although it is less sensitive, there's no denying that the three polar patterns offered by the AT2050 add greatly to its versatility: although cardioid patterns tend to get used the most, the excellent side‑rejection of the figure‑of‑eight pattern can be a powerful ally in avoiding spill, while the omni pattern tends to produce a more natural sense of space where spill isn't an issue. The mic is well suited to a number of studio applications, including vocals and a useful range of acoustic and electric instruments. Both the 2035 and the 2050 are built to a very high standard, and they can handle very high SPLs, so they won't get upset being in front of loud guitar amps, wind instruments or drums. Although the addition of the switchable patterns makes the 2050 around 50 percent more expensive than the 2035, it still sits in the same entry‑level price bracket, where both mics offer an impressive level of performance. When you weigh up the sound, the build quality and the cost, the two new models seem to be just as much a bargain as the AT2020. Audio-Technica are one of the few companies to specialise in back‑electret technology for use in this type of microphone, so there are few direct alternatives. However, in most applications, permanently charged or back‑electret capsules and externally polarised capsules do much the same job, with the exception that back‑electret models usually work well from reduced phantom‑power voltages. Low‑cost capacitor models with similar capabilities, are offered by Rode, MXL, Studio Projects, AKG and SE Electronics, amongst others. Shockmount and storage pouch included. Other than the slightly reduced sensitivity of the AT2050, which won't be a problem for normal studio use, there are no obvious cons. 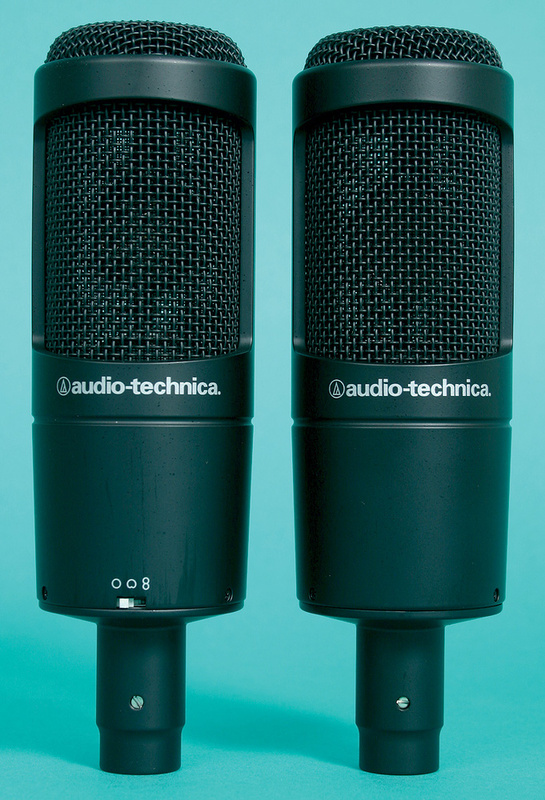 These are both excellent little mics that expand on the concept of the AT2020 while remaining eminently affordable. AT2035 £159; AT2050 £219. Prices include VAT. Audio-Technica +44 (0)113 277 1441. Audio-Technica +1 330 686 2600.